PR Special Fasig-Tipton October Sale: Price Is Right? The Paulick Report is pleased to offer a special print publication, available here and at the Fasig-Tipton October Sale, kicking off today in Lexington, Ky. 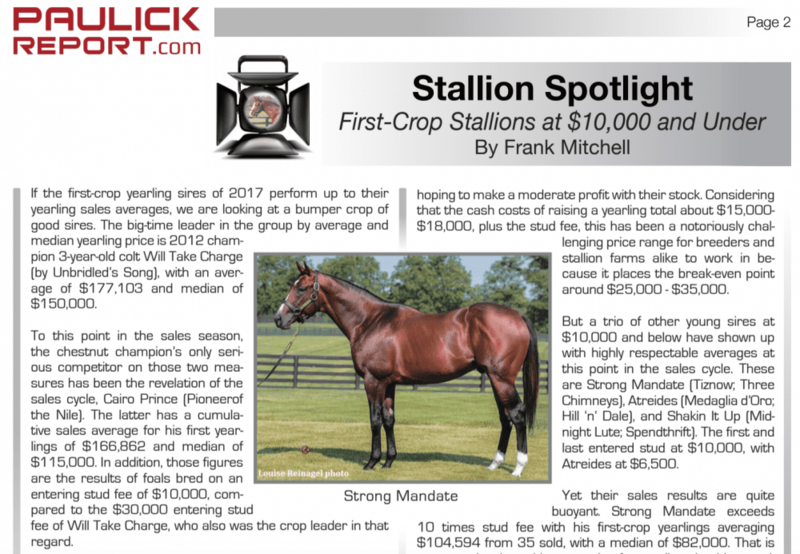 In this edition of the PR Special, Frank Mitchell turns his Stallion Spotlight on first crop sires whose stud fee is $10,000 and under. In the Honor Roll, Chelsea Hackbarth takes a look at Fasig-Tipton October graduate Zipessa, a recent Grade 1 winner pointing for the Breeders' Cup. Denise Steffanus helps us understand equine pelvic fractures, following the death earlier this year of fan favorite and 1999 Horse of the Year Charismatic. Plus, Ray Paulick gives out his bouquets and brickbats in a special edition of Ray's Paddock. Click here to view the Fasig-Tipton October Sale edition of the PR Special. This entry was posted in PR Special, Ray's Paddock and tagged Charismatic, fasig-tipton, Fasig-Tipton October, Frank Mitchell, Honor Roll, PR special, Stallion Spotlight, zipessa by Paulick Report Staff. Bookmark the permalink.